Why are the sheep separated from the goats? 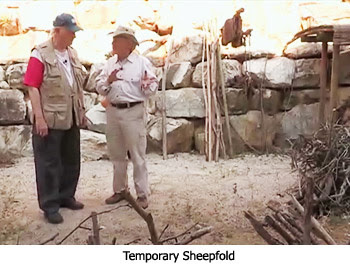 Dr. Reagan: Tell me about what this temporary sheepfold is all about. Dr. Fleming: Right, when you're grazing overnight you have to have a place to protect the sheep at night. You get sharp sticks or thorns and you have to make an enclosure with a removable gate. Predators of course feed at night. So, the most dangerous time for the protection of the sheep is at night. You're trying to find a place where there's a few little caves if you can, particularly because the desert is cold at night and hot in the day. You try to have a sheepfold in the area of your encampment even if you only go part of the year in one location and then come back to a permanent sheepfold, particularly for the winter. A sheepfold needs to be sufficient to keep the sheep in. What happens is not only to keep the sheep in, but it's also to keep the predators out. You have sharp stick pointing out of the walls at the top. Even though some could jump over the wall, they won't because they know they can't pull the animal out over the sharp sticks. Dr. Reagan: This is rather like putting glass on top of the walls like can be seen today in Jerusalem. Dr. Fleming: Exactly. The soft underside of the predator doesn't like those spears, so they keep them out. 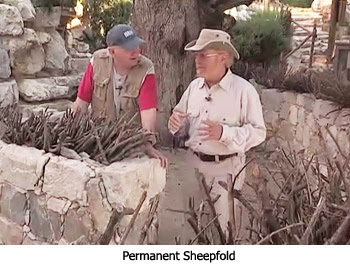 Dr. Reagan: Let's step inside and see what a permanent sheepfold looks like. First of all, why is it divided? Dr. Fleming: It is because of the difference between the sheep and the goats. Goats are much more sure footed and need a higher wall. Their wall is higher than the sheep wall. For sheep, a lower wall is fine. When you come in there is a little slide gate. You separate the sheep from the goats because they'll need a higher and more secure sheepfold. Dr. Reagan: In the back it looks like a cave. Dr. Fleming: Yes, you have two mangers, one for feeding and one for watering. In Bethlehem it can get to 20 degrees in the winter and 120 in the summer. If you have a cave at least 10 feet deep, it will remain 69 degrees year round. That's the insulation factor. There are also mangers and sheepfolds inside the caves. The earliest traditions from the Second Century AD and the Gospel of James which didn't make it into the cannon, but it mentions that Jesus was born in a cave. If you were to ask people in Jesus' day where one would most likely to find a manger, well 90% of the mangers were inside caves again because of the insulation factor. Dr. Reagan: I often wondered about that because I'd always heard about a cave being the place of Jesus' birth, but I didn't know why that would have been the reason for using a cave. Dr. Fleming: Yes, caves are where you would keep the animals, especially in the fall and winter time. You are going to keep them in there due to the temperature, as well as for the health of a mother and the new born babe, you see. When there is no place in the guest room, there would still be a constant temperature in a cave for a guest, so caves are good for a mother and baby as well. 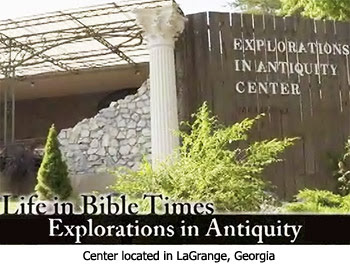 In the fourth part of this series with archaeologist Dr. James Fleming at his Explorations in Antiquity Center, we'll glean some biblical insights by learning what life in the First Century was like when it came to building with stone.